Karate training is sometimes combined with Ryukyu Kobjutsu on the courses and seminars held by the Association. 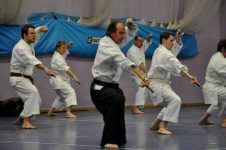 Sensei Mead also provides regular instruction to the established Yui Shin Kai Karate Club in Surrey, United Kingdom, where new students are always welcome. 8-9pm mixed and 9-10pm Black Belts only. Ryukyu Kobujutsu training is held on Wednesdays from 8-9:30 pm.